Contains all the essentials needed for students to practice and perform the hair renewal process. 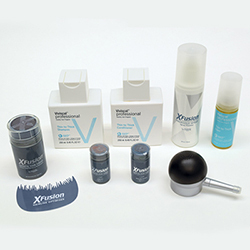 Carefully formulated to stimulate healthy hair growth and treat hair loss. 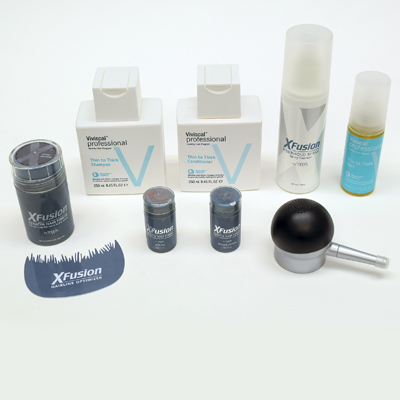 Set includes: XFusion - Instantly add volume or extra coverage for thinning hair with keratin-based hair fibers. Suitable for all hair types including dry, damaged, color treated, fine and/or thin hair. Hair Fiber - Dark Brown - .53 oz., Medium Brown - .11 oz., Auburn - .11 oz., Fiberhold Spray - 4 oz., Spray Applicator, Hairline Optimizer. 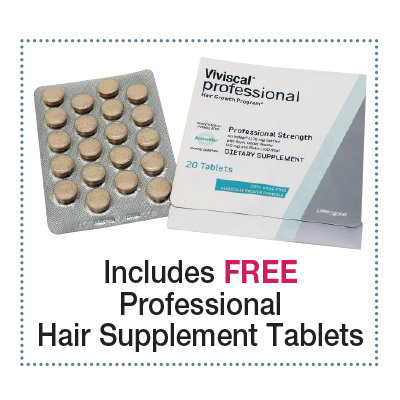 Viviscal Professional - Formulated with biotin, collagen, keratin and Ana:Tel, a proprietary complex containing clinically tested ingredients derived from natural sources which strengthen and thicken hair. Shampoo - 8.45 oz., Conditioner -8.45 oz., Elixir - 1.7 oz., Hair Supplement Tablets - 20 ct.